Every year on Valentine's Day whilst couples go gooey over one another; over candelit dinners and fine wines, Bushman is sweating it out in the kitchen. Spare a thought for your chef, ladies and gentlemen, he foregoes his own Valentine delights so that you can have yours. In the seven Valentines' days we have spent together we have never been able to indulge in that ritual. But with a little creative thinking (usually on my part) we make the most of whatever time we have together. Many years ago we had a midnight feast when he had finished his shift, but this year we had breakfast together. Its not easy to cook a dish from another culture, especially when you are cooking for a chef. 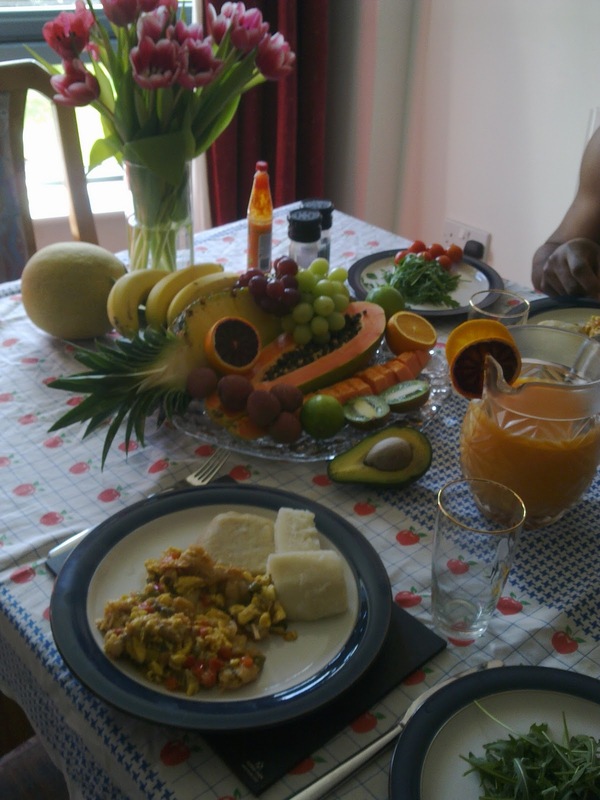 But my first attempt at Jamaica's National Dish wasn't too bad - or so I thought. We even had love toast. 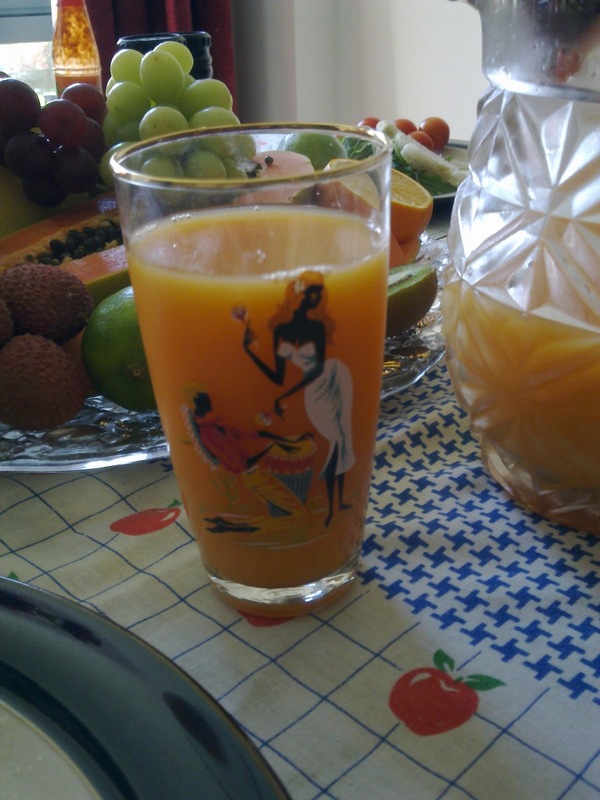 And drank juice from my grandmother's fabulous vintage, Caribbean-inspired glasses. Bushman bounced baby sister on his lap while she sucked on various fruits. First born helped himself to everyone else's love toast and took up the salt mill. "Yuh know people eat cow tail inna Jamaica?" "Well back 'ome, a man leave 'im wife because she cook de whole ting, she not even take off di skin!!" He laughs and I'm not quite sure if that's some kind of warning that if my food isn't up to scratch he'll leave me? This is the recipe I used for Ackee and Saltfish. Personally, If I made this again I wouldn't add spicy tomato sauce as suggested in this recipe - I would use fresh cherry tomatoes instead. You could leave out the ginger, although it did give it a nice kick and there is no reason why you shouldn't use the whole spring onion. But the most important thing is to buy SALTED COD WITHOUT BONES!! Ask the shopkeeper or read the packets very carefully. You will also need to boil the cod for a little longer than suggested in this recipe, 5 minutes is not enough!! Serve with 'hard food' as they call it in Jamaica which can be anything from boiled yam, boiled potatoes, green bananas, boiled sweet potato, or dumplings (haven't mastered them yet - not like English dumplings). Jamaicans usually make boiled or fried dumplings (check out this guide to dumplings). Both Ackee (in tins) and Salted Cod, can be bought in Afro-Caribbean shops or other ethnic foodstores and depending on where you live check out the 'World Foods' section of your supermarket. You might also find hard dough bread (which I used to make the 'Love Toast') - it is dense enough to use a cookie cutter on. Lastly, we had a delicious combination of juices Carrot and Apple, Clementine and Tropicana's 'Ruby Breakfast' in equal parts. And of course the delightful fruit platter!! Created in part for Tara's Gallery . Mental note...must take skin off the cows tail before I cook it. Sounds delicious. And very good point about chefs and valentines day, hope he made some good tips. That all sounds fab. Doesn't sound quite as exciting as a bowl of Special K.
You went the whole way! I think he should count his lucky stars. Fabulous, hilarious! The heart toast is ingenious. Hilarious! Such dedication, I'm impressed! 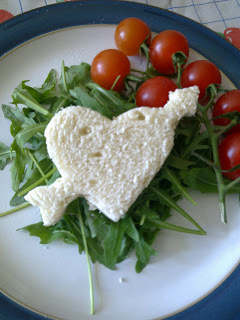 I love the heart toast, if I served it up to my man he'd ask where the rest of it had gone! I never took you for a heart toast kind of girl. There is a soft, gooey centre to Troutie after all! Just trying to remember what we had on Valentines Day - ah yes Chicken Kievs - all six of us "romantically" round the table discussing GCSE options and A levels. HHHMM its our anniversary next week - must try harder!